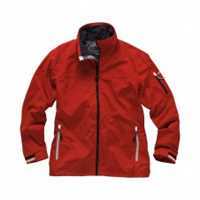 The Crew Lite Jacket offers performance and protection with its use of a durable, waterproof and breathable 1 Dot™ fabric coupled with a cooling mesh lining making it the perfect choice for sailing, travelling or just out and about. Internal chest pocket and zippered sleeve pocket. Internal ghost zip for easy branding. Female specific design and fit. 1 Dot™ waterproof and breathable fabric.